TimeFracture Laboratory Page. Click on pictures to get larger/higher quality images. 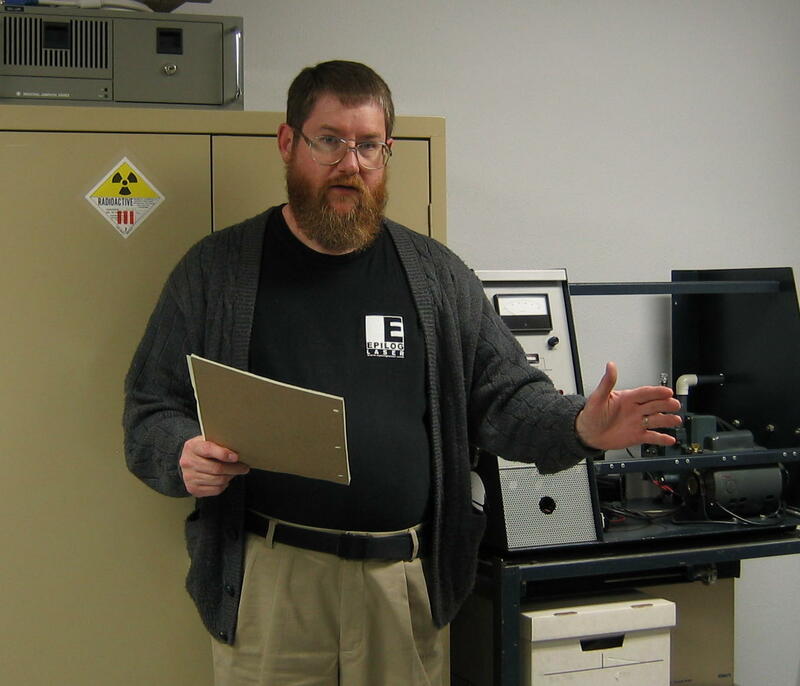 Let's take a tour of my laboratory, which is located in the basement of my home in Littleton, Colorado. As we look around, I'll show you some more old projects, as well as the ones currently under development. « Howdy; I'm John Doran! I have a brief autobiography in the Documents section below. 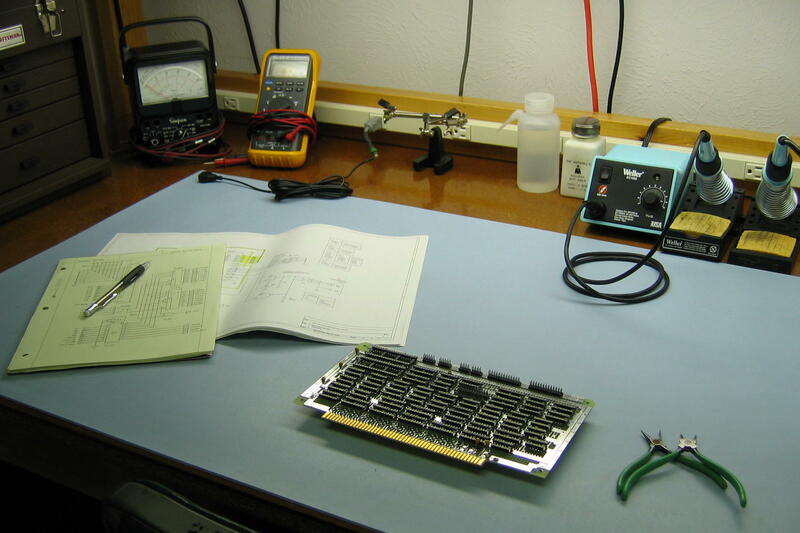 « The heart of my laboratory is this new custom-built test bench. Note the equipment shelf above the work-surface, and the little multi-drawer cabinet secured underneath. This bench has really facilitated my work, and I regret not having built it long ago. « Here is a closer look at the bench's work-surface, with the light switched on. 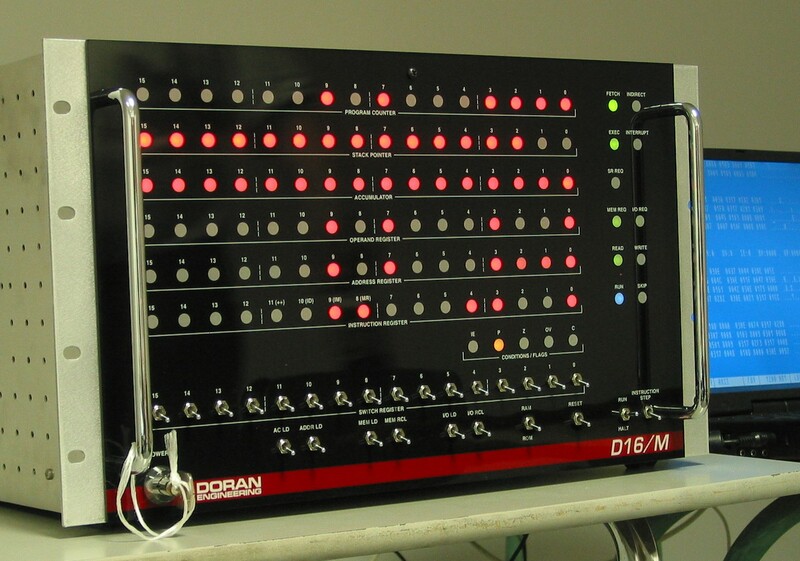 The board is the Serial/Parallel I/O module for the D16/M minicomputer; documented on the D16 page. 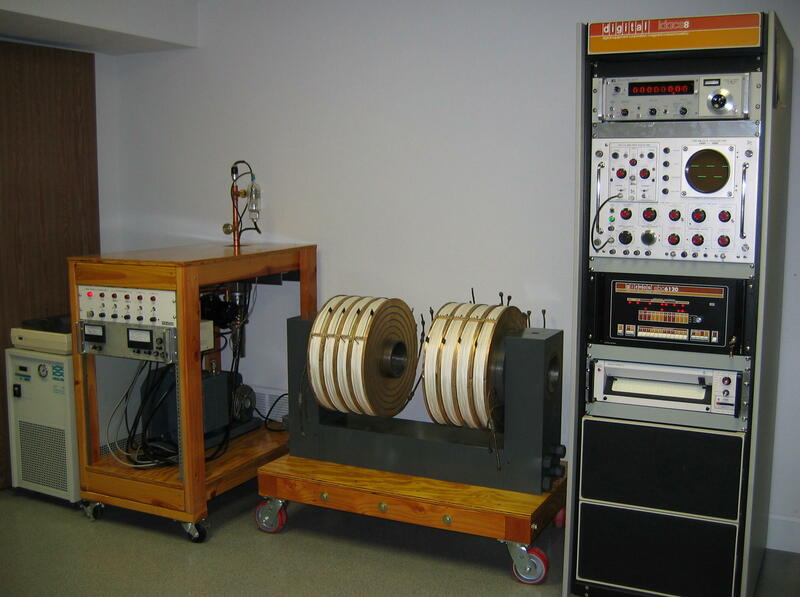 « This is a view of the lab's northeast corner. At left is my roll-around power-supply rack, and in the center is the time-and-frequency rack. On the right is my amateur radio station (KV0L). 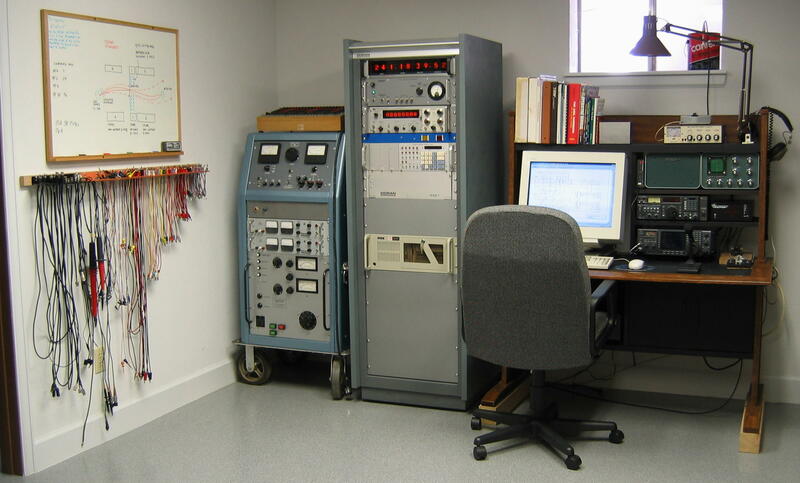 In the top of the T/F rack is a homebrew digital clock which automatically sets itself, using the 60 kHz VLF time signal from WWVB up in Fort Collins. I built it into an old time-code display unit. 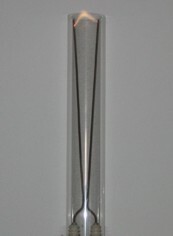 The WWVB receiver itself is just below the clock. Nowadays, you can buy an autosetting clock for around $30! The T/F rack also contains my SCALE-7 microcomputer and my laboratory PC. 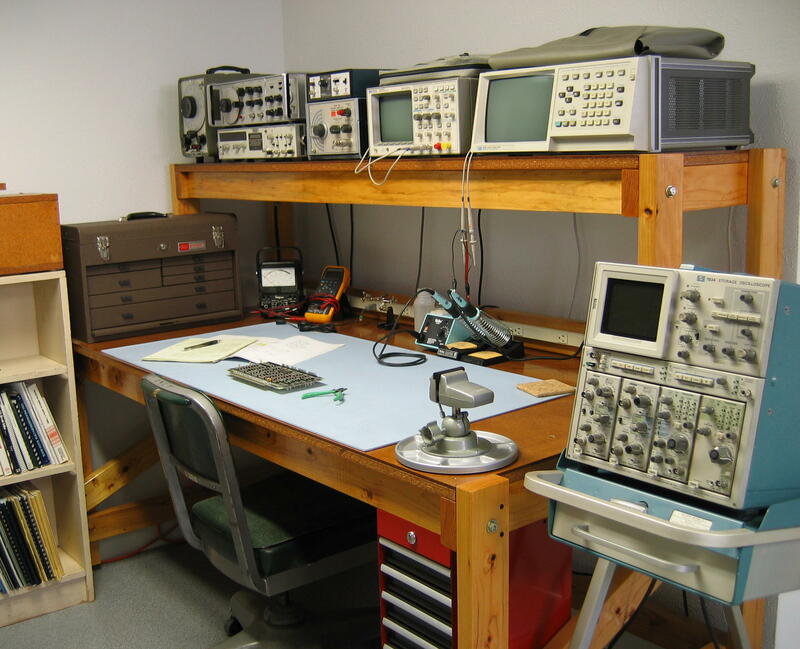 « This is my parts bench, in the southeast corner of the lab. 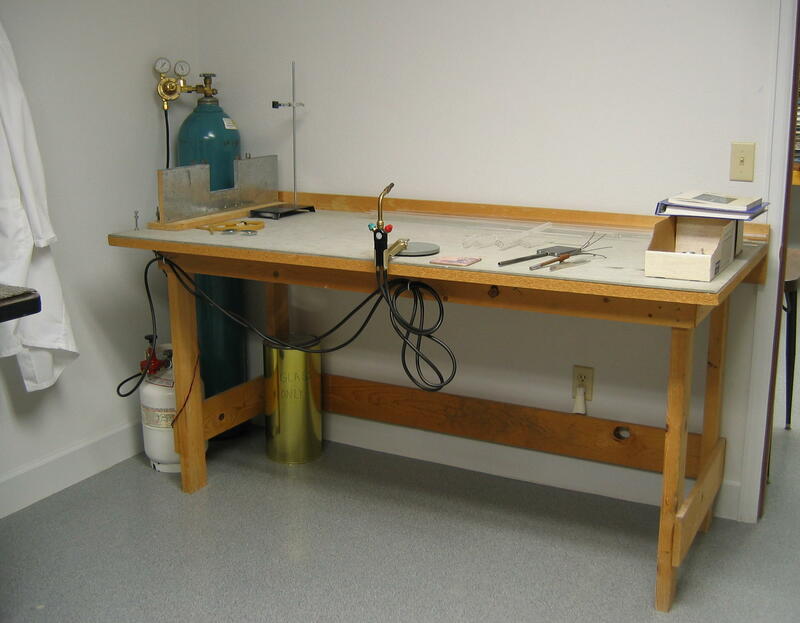 This long table was my original test bench; I used it for many years before I built the new one. I store my big laser power supplies in the corner. The black box on the top of the stack is the D16/M minicomputer. « Here is a view into the Special Projects lab, through the door in the north wall. I cannibalized an old Tek 547 oscilloscope to make the "wall- hanging" on the upper left. Please don't accuse me of sacrilege; the unit had many broken switch-wafers and was unrepairable! 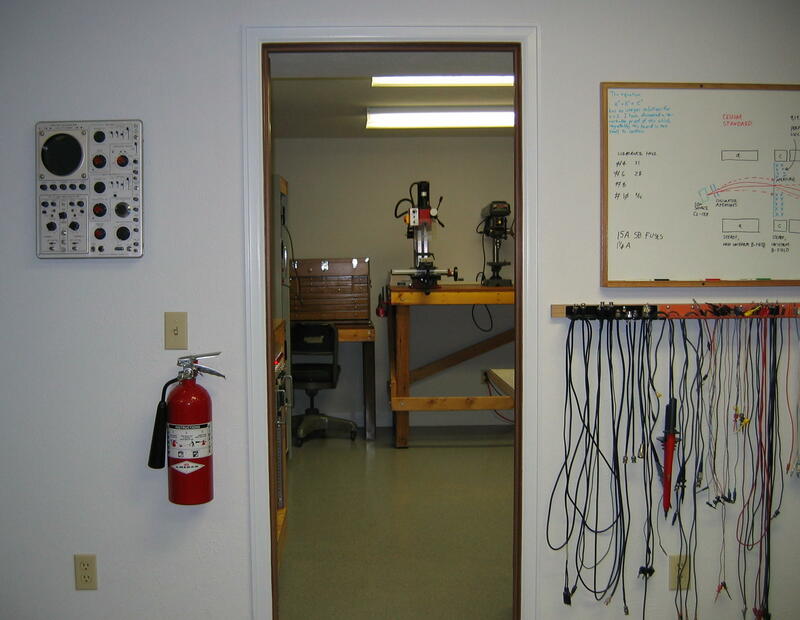 « This is a look into the Special Projects lab's northeast corner, showing my mechanical bench with the "mini-mill," drill press, and vise. 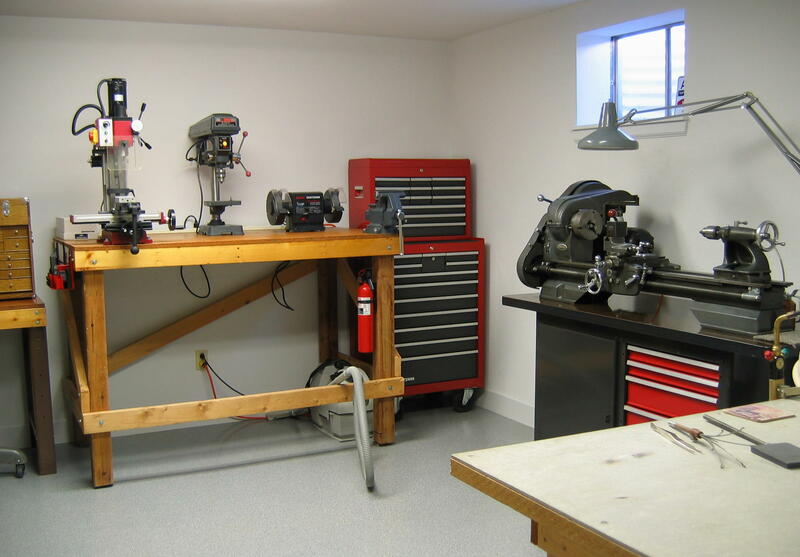 On the right is my old Atlas/Craftsman bench lathe. « Here we are looking southwest. At the left is my high-vacuum pumping system. In the middle is a big water-cooled research electromagnet that I am restoring, and on the right is a rack containing more test equipment. 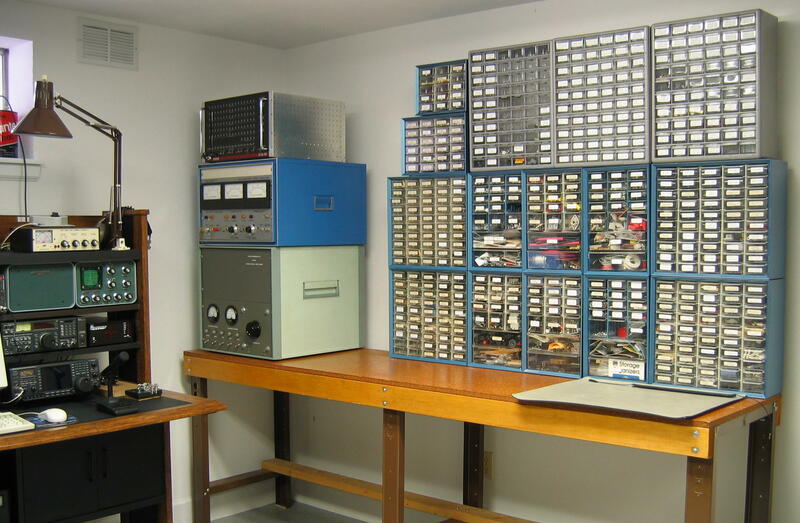 The computer in the rack is Bob Armstrong's SBC/FP 6120, a functional replica of the DEC PDP-8 minicomputer. « Here is my glass-blowing bench, in the southeast corner. 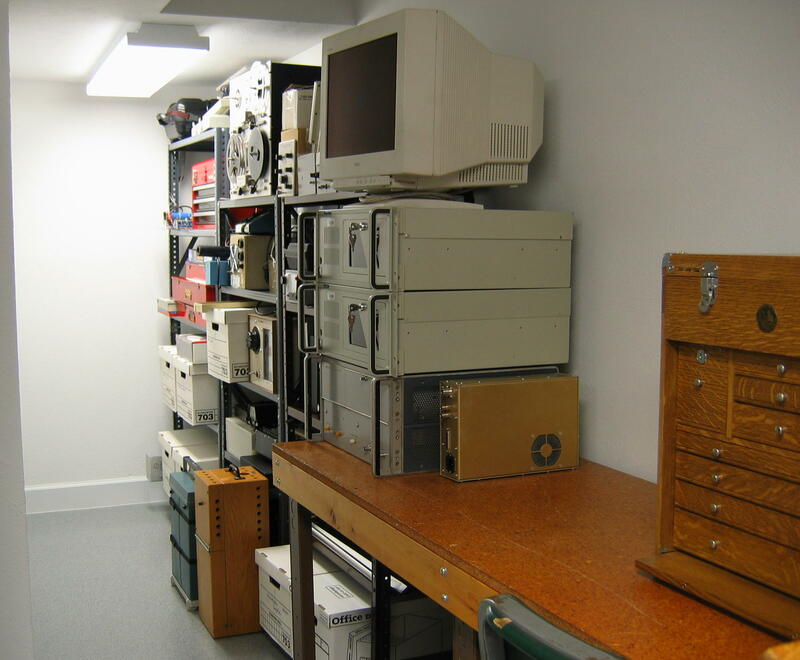 In the northwest corner of the Special Projects lab, there is a little alcove for equipment and supply storage. « Now, finally, what "mad scientist's" laboratory is complete without Jacob's Ladder? This old prop rests on top of the bookshelf beside my test bench. 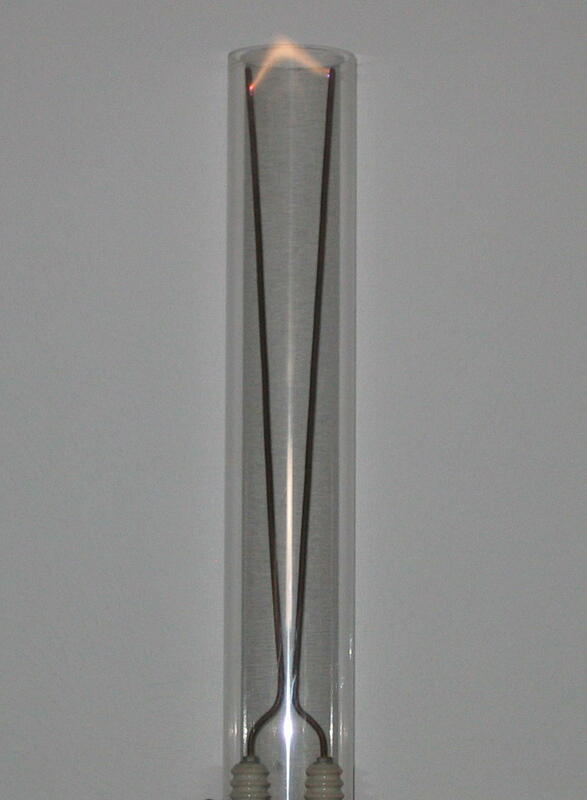 recommended lab gear, such as test instruments, tools, and supplies. bio (HTML) Here is some information about me.